Is a low odour, fast setting, fast drying, two component smoothing underlayment suitable for preparing sound internal subfloors prior to the installation of new floorcoverings. It is particularly suitable for use over old adhesive residues (including bitumen and carpet tile tackifiers) without the need for priming. 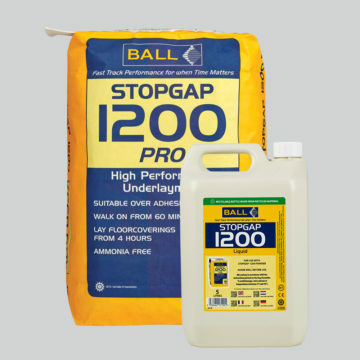 STOPGAP 1200 can be used for patch filling timber floors prior to overlaying with plywood. It is suitable for use in clinical and biologically sensitive areas, clean rooms etc. STOPGAP 1200 mixed with STOPGAP 1200 Liquid has been tested in accordance with IMO 2010 FTPC Part 5 (IMO Res. MSC 307(88)) and Annex 2 item 2.2 and approved for use in marine application by DNV. Marine Certified Tested to the standards of the International Marine Organisation and approved for use in marine floor installations.